Loved it so much I had to grab another one, love the extra pocket! I love Carhartt clothing line. However, I had to mail two shirts back that didn’t fit. I was told last week the money would be back on my card at the beginning if this week. I called today and was told it would be another 3-5 business days before the money is put back in my account. Super comfy and fits well. Would recommend!! I have two of these hoodies, in different colors and they both fit me perfectly. I purchased them both in a small and they were very nice to wear throughout the winter to keep me warm. There is also a second pocket located in the hoodie pocket to hold your phone. I wear this hoodie ALL OF THE TIME. The inside is so soft and it really keeps you warm! Great quality, great product. I definitely plan on buying it again in different colors. I’ve barely taken it off since I bought it. I wish I would have ordered more!! This sweatshirt is great! Super comfy and the right amount of warmth. I love the fit! I’m a big fan of carharrt in general but because I’m more “petite” some things do not fit me the way I’d like. This however, fit great! Not too fitted but not too baggy, super cute! I’m 5’4” 118lbs petite/fit build. The wife loves it. Fits perfect, very warm!! It is very comfortable, the cuffs a bit too big for my small wrists. I like the older ones better these have too much polyester. The older style was 80% cotton/ 20% polyester, the newer ones 55% cotton/ 45% polyester. Best hoodie I’ve ever bought! Fits perfectly, warm, and extremely soft. I do a lot of outdoors activities this is the perfect sweatshirt, warm and fits just right. very durable! planning to buy a few more in different colors! Runs large - need to return for a smaller size. Love this sweatshirt. Fits in all the right places. Ordered two! Perfect fit! Warm and cozy, I need one in every color! I own the Black & Fudge Heather. Nice, thick, soft and comfy hoodie. Great fit nice color and good quality ! Great fit , Nice color and good quality ! Absolutely love it ! 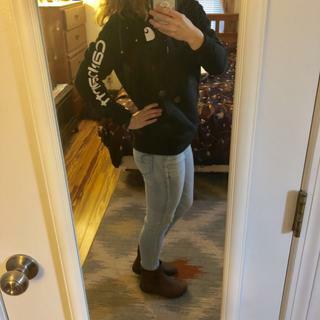 Comfy,warm, looks great and fits great! Will definitely be buying more. This product looked exactly like the picture. It is very comfortable and fits perfectly. Carhartt sweatshirts are my go to in the winter. Super comfortable and warm. I just got this one in fudge heather and I love it! I’m 5’8” and 135 pounds, and the large fits me perfect. It has just enough room to move around in it comfortably. The color is super cute too and it goes perfect with my dark brown carhartt vest! 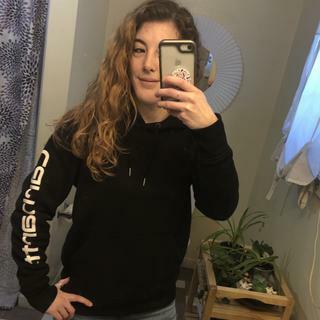 This hoodie is so comfortable and cute! It fits great! This sweatshirt is so comfortable and warm!! will be buying all the colors! Exactly what I was looking for! The fit is perfect and the sizing is spot on! Thinner quality then I expected and more of a fitted look then expected. Order up a size or two if you are looking for a baggier hoody. Incredibly comfortable! Runs slightly larger than some of the other hoodies I’ve bought in the same size. Has a media pocket for easy access to your phone or MP3 player. Fudge heather is definitely my favorite color, but black is a close second. Super cozy and warm too! Better than your average sweatshirt! It was a gift for my granddaughter. She loved it. The quality is good and it looks very nice. Bought it as a gift for my girlfriend and she loves it. Just like everything else I've purchased from Carhartt, seems to be very well made. Thank you for your feedback. Please contact our Customer Service Department for further assistance at 1-800-833-3118. How much smaller is an xsmall compared to a small? BEST ANSWER: An X-Small will fit someone with a bust measurement of 33 inches while the Small will fit a 34-35 inch measurement. what is the measurement across the chest right below the sleeves on a small? BEST ANSWER: The chest at the armhole measures about 41 1/2" around in size small. On my screen the “fudge heather” looks burgundy. But the name would imply it’s brown, which is it? BEST ANSWER: The Fudge Heather is going to be a burgundy like color. What is the sleeve length on this hoodie? BEST ANSWER: The measurement may vary by size. Please contact us with the size you are interested in for further assistance. How long is this hoodie? BEST ANSWER: The length of the sweatshirt will vary by size. The XS is 25 1/2 inches, the Small is 26 inches, the Medium is 26 1/2 inches, the Large is 27 inches, the XL is 27 5/8 inches and the XXL is 28 3/8 inches. BEST ANSWER: This item is currently available on our site. Do these shrink at all when washed and dried? BEST ANSWER: It should not shrink more than 2-4% throughout the life of the sweatshirt as long as the care instructions are followed.